Selling a motor vehicle on eBay can present a unique set of complications and challenges that the typical eBay trader might be unfamiliar with. Here's how to go about it if you've decided it's time to try your hand at selling on eBay Motors. Complete eBay's checklist. It's important that you supply accurate information, so you'll need a variety of information at your fingertips. eBay suggests having the vehicle's registration, insurance documents, and title in front of you—at a minimum. You'll obviously have to state the make, model, year, mileage, and vehicle identification number (VIN) of the car you want to sell. You'll also want to pinpoint all its features. The eBay form includes boxes for everything from that sunroof you were once so proud of to different safety features, power options, and warranty information. Don't guess at anything. If you're still unsure about a feature even with all that documentation in front of you, just go look at the vehicle or dig the owner's manual out of the glove compartment. Now you're ready to prep your transaction. 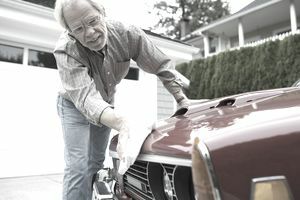 Even if you're not hoping to get much money for the vehicle in question, spend half an hour to an hour giving it a good washing and cleaning out its insides. If you're selling parts, clean them up and make them as presentable as possible. Take lots of photos inside and out. Vehicles are high-value items that are extremely durable. They cost a lot, and buyers will typically use them for a long time. Take the most photos you can to help them make a decision. Shoot from multiple angles, then select the best and most representative photos for your listing. You might also want to take a picture of the odometer while you're at it and any of those cool features you mentioned in the checklist. After all, a picture is worth a thousand words. Make sure you have a copy of the vehicle's title and that it's free and clear of any liens or other legal entanglements. If you're selling a late-model vehicle and it's in running condition, ensure that its registration and any applicable fees and taxes are current in your state. You'll want to be able to demonstrate to buyers that the vehicle is in good operating condition if they want to come out and test drive it. Documentation of the transfer of ownership is required for most titled vehicle sales. A letter simply stating the identity of the buyer and seller will usually suffice. The letter should also state the make, model, year, color, and VIN of the vehicle. Although it's typically not required, potential buyers might feel more comfortable if you provide a vehicle history report, such as from CARFAX. Check with your local motor vehicles division for detailed requirements that might be unique to your state. Be prepared to co-sign state-required documents with your buyer before you list your vehicle for sale. When you do sign, keep one copy for your records and deliver the other copy to the buyer. It's time to actually post your listing on eBay Motors after all your initial preparation is completed. You can find the selling form in the typical place on the eBay website at the upper right of any page under the word "Sell." Set your reserve minimum price if you're going to auction the vehicle, as well as a "buy it now" price if you want to offer that option. Consider whether you're willing to finance the purchase and, if so, at what terms. The fee structure for listing items on eBay Motors is considerably different from the fee structure for regular items. Check the table of fees for eBay Motors to find out how much it will cost you to sell your vehicle or parts. The fee is typically due at the time of the sale, not when you first list the vehicle. As of 2018, it's based on the sales price. Be clear and up-front about any aftermarket parts or changes to the vehicle. These things can affect warranties or the value of a vehicle, so be sure to note any aftermarket or third-party improvements or alterations that have been made. This might include rim sizes that have been changed due to a remodeling of the interior. Note the specific make/model/configuration of the alteration and the date of installation whenever possible. Remember shipping complications. In most cases, a restriction to "pick up" or "drive away" the transaction is in order because vehicles and many vehicle parts are extremely bulky items. If you're willing to ship and/or deliver the vehicle or item in question, state so clearly and give limits, if any, to your delivery range. If the item is available on only a "pick up" or "drive away" basis, state this clearly in your auction listing as well. While the thought of selling a motor vehicle or major motor vehicle component on the internet remains a radical one, more and more cars, trucks, motorcycles, and other vehicles and their parts are sold on eBay every day. Keeping these tips in mind can help you to get started as an eBay Motors seller.